Jan Samson joined Cavalier Ambulance in 2002 as a driver. 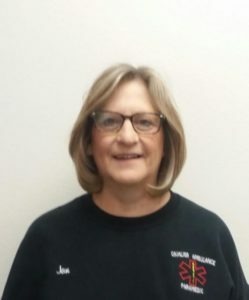 Jan’s passion for EMS led her to complete EMT coursework, then continue her education to attain her Paramedic credential in 2008. She progressed to working as a full-time Paramedic in 2009. Samson continues to serve her community in this capacity to this date. Jan is currently a regional director with the North Dakota EMS Association. Through her efforts as the Pembina County EMS Education Coordinator, area ambulance services have gained many new and very well-trained EMRs and EMTs. In addition to organizing in-person training for Pembina staff, Jan positively impacts the larger region through the administration of web-based e-learning for EMS personnel from farther afield. Jan has shown great interest and aptitude in developing her leadership abilities. This is manifested in her mentorship of new staff, as well as the application of new leadership concepts and techniques gained from her classes with SafeTech Solutions. For many EMS providers new to the profession, the learning curve can be challenging, especially within a rural Advanced Life Support service like Cavalier. Samson works patiently with EMRs and EMTs to help familiarize them with ALS equipment and procedures. She ensures that these BLS-level staff have an understanding of the advanced measures, so that they can be of assistance in a time of need. Jan’s commitment, dedication, and passion ensure that we are proud to call her a 2017 Star of Life. In her time away from Cavalier, Jan enjoys spending time with her adult children and first grandchild.